President Goodluck Jonathan yesterday congratulated the Super Eagles for beating Ethiopian team 2-0 to book a place at the 2014 World Cup finals billed for Brazil. 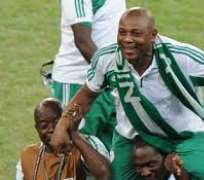 In a statement by his Special Adviser on Media and Publicity, Dr. Reuben Abati, the President applauded Super Eagles' dogged and determined performance in the two-legged play-off against the Ethiopians. Noting that the Eagles will be playing at the World Cup Finals for the fifth time, he also commended the team's performance in all the preceding qualifying matches and the consistent commitment and dedication of the players to building on their victory at this year's African Nations Cup. He believed that with the enormous pool of footballing talent available to the country, the Super Eagles can, with more hardwork, dedication, resilience and further honing of their skills and tactics, fulfill the national dream of being the first African Nation to win the World Cup. Jonathan assured the NFF and the team of the fullest possible support of the Federal Government and all Nigerians in their quest to win even greater glory for Nigeria in Brazil.